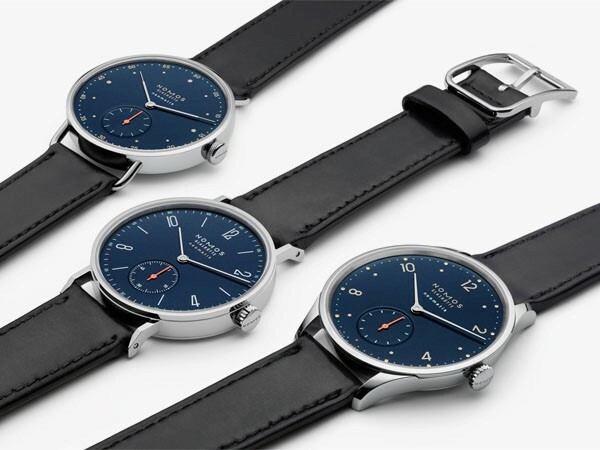 Nomos just introduced three new models sporting striking blue dials: the Minimatik Neomatik, the Metro Neomatik and the Tangente Neomatik ‘Nachtblau’. Nomos introduced its Neomatik movement in 2015 in the Minimatik, Tangente and Metro models. The choice of dial was either silver or champagne. With the ‘nachtblau’ watches, Nomos has now added a third option – and IMHO it looks stunning. The dark blue tone gives these watches a whole different vibe- chic, mysterious, luxurious – without loosing any of the Nomos character [that I’ve come to love so much]. All three feature a neon orange seconds hand.